them—not to mention the growing numbers of spiritual and religious venues created to assist with questions of faith and identity—for young Jews in Budapest these may be the best days of their lives. It is edging toward midnight, and a smoky haze clouds the Sirály café in downtown Budapest’s old Jewish quarter. At wooden tables, young people nurse beers or espressos, while techno-punk music throbs beneath the buzz. A few people sit alone, peering intently at their laptops, taking advantage of the free Wi-Fi service. 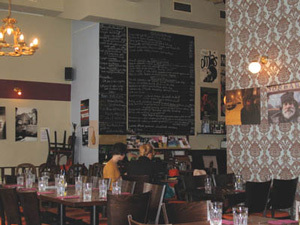 It is a typical scene in one of the many crowded, youth-oriented cafés that have cropped up in recent years in this funky, inner-city neighborhood. But a few things set Sirály apart. For one, there is a mezuza prominently displayed on its front doorpost. Scattered leaflets advertise a Jewish culture festival, an alternative Jewish theater and a concert by a klezmer-hip-hop-punk band. And upstairs, off a lounge, is an office of Marom Budapest, the youth organization of the Masorti (Conservative) movement. Hungary has the largest Jewish population of any once-Communist state outside the former Soviet Union, with as many as 90,000 Jews in the capital. Twenty years after the fall of Communism, young Jews in Budapest are staking a claim in their identity in bold new ways that are changing the face of Jewish life in the city. Call it Generation J on the Danube. The institutions that were the hallmarks of the first decade of the Jewish revival still exist—and in many cases continue to flourish. These include more than a dozen synagogues in the city; three main day schools; the Jewish University; the all-purpose Balint Haz Jewish Community Center, opened in 1994; the Jewish Cultural Association (www.mazsike.hu); and publications such as the independent Szombat monthly. But a host of other Jewish initiatives, projects and organizations now thrive alongside them. The range is vast. Its scope reflects a dynamic diversity in a generation that rejects definitions of Jewish identity based on the Holocaust, shtetl nostalgia or conventional religious practice, and increasingly seeks models in the Jewish lifestyles found in New York, Paris or Tel Aviv. Youth-oriented Jewish initiatives run the gamut from small, unaffiliated minyanim that meet in private apartments followed by Friday-night dinners to avant-garde culture festivals. For example, a three-day Bánkitó festival was held at a lake in northern Hungary this past August. It featured jazz, funk, klezmer, hip-hop and fusion concerts by local groups as well as exhibitions, films, lectures and workshops. There are Jewish theaters, such as the Golem Theatre and the Budapest Jewish Theater. And a Moishe House, a combination dorm and community center, opened in the old Jewish quarter in September. Educational opportunities alone include academic programs at Central European University and Eötvös Loránd University, Torah study groups, Jewish lecture series, student clubs and an annual Limmud gathering that in 2008 drew 300 participants. “People are still just as much looking for new forms to express their Jewish identity as they were in 1989,” said 33-year-old Bruno Bitter, who runs a Jewish pop cultural blog called Kajmánsziget (http://kajmansziget.tumblr.com). As elsewhere, the Internet is another popular forum for Jewish expression and there are a host of Hungarian blogs and Web sites, such as Jewish Meeting Point (www.jmpoint.hu) or the music site Jew Box (http://jewbox.hu). Unlike the sometimes kitschy Jewish cafés that cater to tourists in Krakow and other East-Central European cities where few Jews live, there is nothing nostalgic about these venues—and often nothing overtly Jewish. The décor of the Szoda café, which is owned by two Budapest-born Jews who lived in Israel for a time, features manga cartoon designs, 1960s retro furniture, an orange color scheme and a basement dance floor. A number of venues offer Jewish programming. Sirály, for example, is a cross between a pub and cultural center. Managed largely by Marom, it hosts exhibits and other events, including performances in its basement theater (www.siraly.co.hu). The Spinoza coffee house and theater, a few blocks away, also features Jewish-themed events, but mainly targets an older crowd (http://spinozahaz.hu). Last Hanukka, an eight-day festival at Sirály featured experimental performance groups and music as well as lectures on fried foods and the holiday, a round-table discussion on Jewish identity and a talk on charity by local rabbi Istvan Darvas of the Nagyfuvaros Street synagogue. Café service was halted each evening to chant the blessings and light candles on a menora set up on the bar. In many ways, young Jews in Hungary are trying to answer the same basic questions faced by their parents and older siblings in the years after the Iron Curtain came down: What does “Jewish” mean? How can one be Jewish? What are the prospects for a viable Jewish future? Thanks to the efforts of organized Jewry and the first generation of outreach programs supported by the Joint Distribution Committee, Chabad, the Ronald S. Lauder Foundation, the Jewish Agency and others, there have been myriad ways to experiment over the years. “When I was growing up, exploring Jewishness was [part of] a cool new identity,” said 31-year-old Anna Haraszti, a math teacher. Her parents are Jewish, but she grew up with little knowledge of Judaism and only began taking interest in it in her teens. Today, she finds her comfort zone by frequenting Sirály and other informal spaces where young Jews gather simply to connect. Others, however, have embraced religious practice. Some have formed their own congregations or meet with friends in informal prayer and study groups. Many are drawn to two or three established synagogues with sympathetic young rabbis. Born little more than a year before the Iron Curtain came down, Adam attended Talmud Torah classes and celebrated his bar mitzva. Like hundreds of other Jewish children, he also spent part of each summer at the JDC/Lauder Foundation Jewish summer camp at Szarvas in southern Hungary, a flagship outreach program that opened in 1990 and is still going strong. It hosts some 2,000 children and teens each summer, about half from Hungary and half from other countries. Years later, Adam was so moved by a cantor’s singing at his grandfather’s funeral that he decided to become a cantor himself. He now studies Torah with Darvas and is enrolled at the rabbinical seminary that forms part of the community-run Jewish University. There are half a dozen students in his class, he said, two of them taking the cantorial course. Adam, who attends the Nagyfuvaros synagogue, located in a working-class downtown neighborhood, plans to stay in Budapest and help foster religious education and practice. “It’s important to support Jewish life here,” he said. Still, many young Jews chafe under the templates for observance and identity laid down by the Jewish establishment and are turned off by communal politics or personalities. Judapest’s antiestablishment attitude toward what it dubbed the “worn-out” Hungarian Jewish mainstream gained it a loyal following, with as many as 3,000 hits a day. It described itself as “a grass-roots online and offline community” aimed at uncovering “the relevant, the stimulating and the cool in the Hungarian Jewish Experience.” In addition to the blog, it sponsored brunches and other events and published a successful Jewish cookbook, Fuszer es Lelek (Spice and Soul) by Eszter Bodrogi, that combined kashrut with haute cuisine. Bitter’s decision to shut down Judapest in January 2009 to concentrate on his family and career as a market researcher initially left many followers bereft. But a few months after closing Judapest, Bitter started Kajmánsziget, which he called a “microblog” aimed at posting “fun links, light stories, goofy Jewish videos.” It is not a continuation of Judapest, he said, whose content was heavy on opinion pieces, debates and social and cultural commentary. Whether the plethora of nontraditional choices now on the Budapest Jewish menu can provide those answers remains to be seen. “A lot of people don’t know what is Jewish. They are not interested in learning; they are only interested in self-expression,” said lawyer Agnes Peresztegi, an observant Jew who eight years ago helped organize the Pesti Shul, an independent modern Orthodox congregation. The past two decades have seen a bewildering host of Jewish initiatives come and go, becoming popular and then fizzling out when resources dried up or leaders lost interest or, as with Bitter and Judapest, simply moved on. New organizations, individuals and initiatives then emerge to fill the gaps, in a process of continuing turnover. In addition, noted Kata Zsofia Vincze, who has studied both Jewish outreach movements and the contemporary Jewish scene in Hungary, “it is difficult to find permanent support. Most sponsors help project by project, and they expect these institutions to one day become self-maintaining. Cernov works with several new outreach and education groups that have joined traditional players like the JDC in supporting new youth initiatives and fostering a deeper sense of identity. These include the Beit Israel Israeli Cultural Institute, Limmud Hungary and Haver Foundation, which promotes interreligious dialogue and teaches both Jews and non-Jews about Jewish culture, heritage, history and religion. Edward Serotta, who directs Centropa (www.centropa.org), a Vienna-based education and research center on Jewish life in central Europe, is optimistic about the future, if only because the sheer number of Jews in Budapest provides a viable critical mass. He sees the ebb and flow of organizations and activities as part of an ongoing process. “In the 21 years I have been involved with this community, I have seen Jewish organizations…rise and fall,” he said. “What makes Budapest so different is that there are so many of them. Two very successful Jewish schools see more than 1,000 Jewish children daily, there’s a plethora of youth-oriented organizations…. “Just as important,” he added, “there are synagogues where, on any given Friday evening, there are upwards of 100 people and the number of congregants under the age of 7 is far greater than those over 70. Back at Sirály, 30-year-old Robert Vajda sips a drink and surveys the busy scene. Bearded and wearing an embroideredkippa, Vajda embodies both the brashness and the complexity of the new era of Jewish choices in the city. He is the director of the Budapest Jewish Theater, a low-budget troupe whose productions often deliberately provoke: Last year, hooded protestors broke up the performance of a pornographic parody of Hungarian high culture. Vajda is an alumnus of one of the city’s Jewish day schools and attends services at Nagyfuvaros synagogue. It was he who chanted the blessing and lit the candles in Sirály’s bar-top menora at Hanukka.